Scooter Battery Sets are individual 12 volt batteries that can be wired together in series to add up to the system voltage of the scooter. Gas scooters may only use and need one 12 volt battery to electric start the scooter. Electric scooters may have electrical system voltages of 24, 36. 48, or even 60 volts. So the number of battery used may be 2, 3, 4, or 5 to produce that voltage. Batteries used for scooters may last two years before they fail to hold a charge that will produce a ride of any duration. If they overheat they will fail sooner and swell up as the plastic deforms. A cell may fail causing a battery to have no voltage or continuity and one bad battery in a set will make the system voltage zero and unable to charge. So in most cases it is best to test a set of batteries if they are not too old, but often it is best to replace all the batteries in a set at the same time, especially if they are approaching two years of age. Batteries of the same age will charge at the same rate and prolong their life. 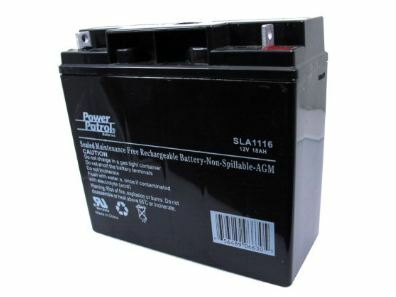 We sell battery sets and individual batteries. The battery sets ship in flat rate boxes to save shipping cost. Batteries are fresh and tested prior to shipment from our warehouse. In addition we sell OEM Battery Sets for all X-treme Model scooters and mopeds on those individual X-treme OEM Parts pages. Great Value! 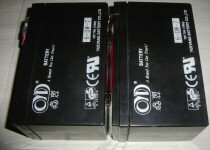 One or Two 12 Volt 5 Amp 20 Hr Batteries (Battery only). Measure 3 1/2"W by 4"H by 2 3/4"D. Use these batteries for a variety of 100 watt scooters. Two in parallel yields 12 volts 10 amphour and takes up less space than one 12v 12ah battery. They also may be used in some UPS swapable battery situations. Use them for back up to expensive batteries where you can exchange them easily for continued operation while main batteries recharge. Order two at a time, or one for your particular application. Each battery has connector tabs and connection to more than one battery or any scooter installation will require wiring them together or to the control box (wiring and splices are not always provided). Wire splicing or connection may be required. Size ea: 3.5"W X 5.8"L X 3.75"H (including tabs). Two fresh sealed battery cells, 12V 7AH. Installs upright or on side, and can be rearranged to 5.8"W X 7.5"L X 3.5"H (Vapor use) or 7"W X 5.8"L X 3.75"H or 3.75"W X 11.75"L X 3.5"H for other scooter configurations. Will fit Vapor, Sunbird, etc. Also fits many UPS Power Supply applications and is available individually for single cell need. (See Below). Each battery has connector tabs and connection to more than one battery or any scooter installation will require wiring them together or to the control box (wiring and splices are not provided). Shipping and handling are included in the total price when you add your choice below to the Shopping Cart. Wiring for battery sets on this page that consist of 3 batteries that can also be used for sets of 2. 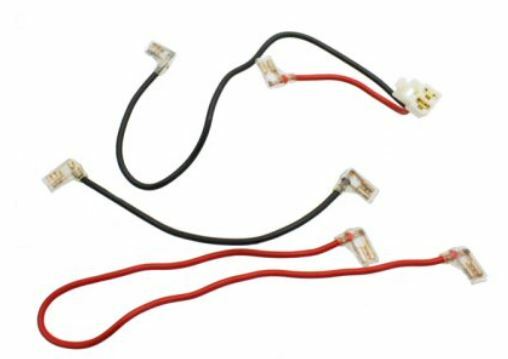 Includes white molex 2 wire connector standard for many scooter control box battery connector. Wiring will includes some battery connector tabs or bare wire ends that will require soldering in either use or connection to the battery. SLIGHTLY LARGER BATTERY SET FOR LONGER RIDES BETWEEN CHARGES! All Electric and gas scooters with an individual lead acid battery size: Length: 5.91 inches (150mm), Width: 3.74 inches (95mm), Height: 3.70 inches (94mm). Fresh 12v 12amp cells for drop in use in X360/370 and many other 36 volt scooters. Use your existing wiring for connection to the scooter or purchase wiring separately. Sold in pairs only for 24 volt system of E-10 scooters or similar using 6.57H x 14.35L x 3.03W battery pairs (each battery measures 6.57H X 7.17L X 3.03W). Each battery has connector tabs and connection to more than one battery or any scooter installation will require wiring them together or to the control box. Use your existing wiring for connection to the scooter or purchase wiring separately. When electric scooters first became popular our Throttles, Controllers, Control Boxes, Battery Chargers, Batteries, Brake Levers, Switches, Key Switches, On Off and Kill Switches, Fuses and Fuseholders, Lighting and Signals, and Common Scooter Electrical Components were available for customers in need who otherwise could not get parts for their model scooters. Electrical Scooter throttles, battery chargers, control boxes were very hard to find, and still are for quality parts. The difference in our electrical parts from others' electrical scooter parts is that we reject the cheap parts sometimes available to us. Plus, we test the parts we sell prior to shipping them to our customers, adding a little bit to the price but insuring quality. Bottom line - fast receipt of quality batteries and battery sets!